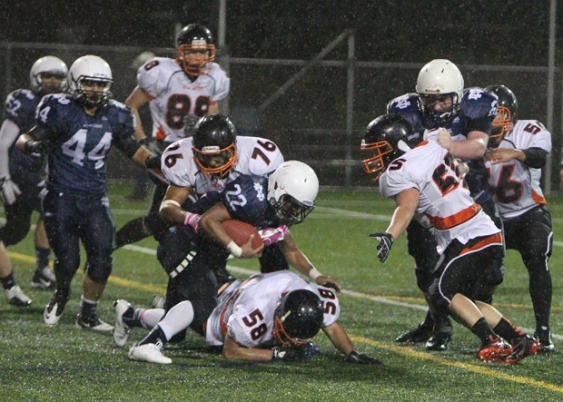 The two longest active winning streaks in the VMFL Midget Division will collide on Hallowe’en night when the undefeated Coquitlam Falcons (7-0) play host to the Langley Stampeders (5-1), winners of their last four in a row. This is the first and only regular season meeting between the two teams that seem destined to clash again in early December once the BCCFA Provincial Championships rolls around. Until that point, however, neither team is going to count their chickens before they hatch and they’ll be focused on just continuing their strong regular season runs. The Falcons have been the cream of the crop of the division all season long and are coming off a 20-8 victory last week over the Comox Raiders. The Stampeders, meanwhile, haven’t lost a game since falling to the North Surrey Bears back in their second game of the season. They’re coming off an easy 45-0 pounding of the winless Cloverdale Bengals. This game could be an early championship preview. Which team gets treated, and which team gets tricked in this Hallow’s Eve clash? 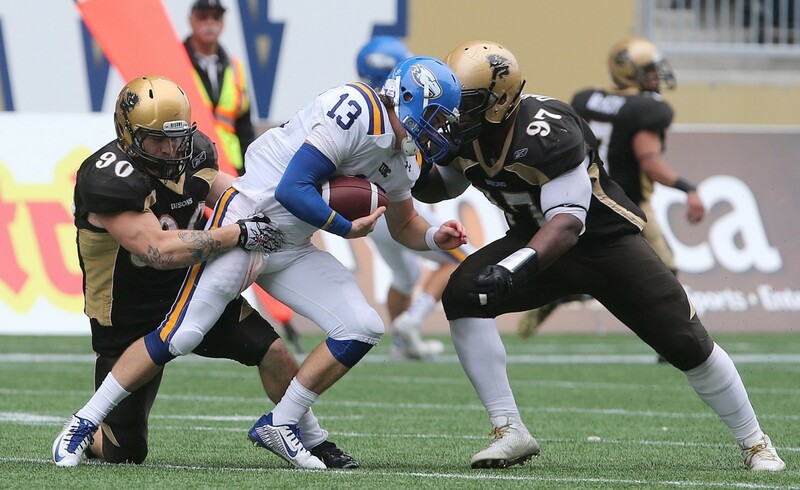 In the final week of the Canada West regular season, it’s a clash of the two teams tied for second place in the conference when the UBC Thunderbirds (5-2) host the Manitoba Bisons (5-2) in a preview of the opening round of Canada West playoffs. After a thrilling 41-36 win over the Saskatchewan Huskies, the Thunderbirds will look to get another win for the fans at home before playoffs begin. In the win, Michael O’Connor went 20-of-31 for a huge 449 yards and three scores, which also rushing for 30 yards on four carries and rumbling for a score of his own. The Thunderbirds’ receiving corps had a great night with Ben Cummings leading the way with three catches for 124 yards and a touchdown, and Will Watson recording six catches for 108 yards. 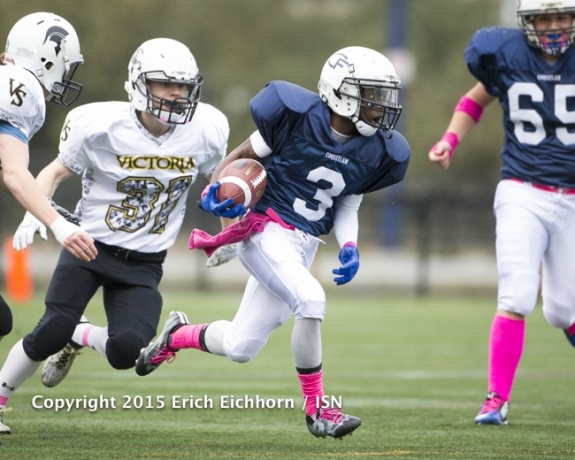 On the ground, Brandon Deschamps led the team with 14 carries for 85 yards in the team’s win. On defence, Terrell Davis led the team with five solo tackles and ten assists, while A.J. Blackwell recorded a game-high six solo tackles. The Bisons, who are also coming off a 29-7 victory against the University of Alberta Golden Bears, were led by Foster Martens who completed 13-of-20 passes for 165 yards. Trysten Dyce led the team with three receptions for 46 yards, but the majority of the offensive numbers were put up by the Bisons’ ground game which totaled 351 yards. On the ground, Alex Christie and Jamel Lyles led the team with 15 carries for 104 yards and nine carries for 93 yards, respectively. On defence, look for David Onyemata and Christian Turner to do some damage after recording 13 tackles (six solo) and 1.5 sacks, and ten tackles (five solo) and 2.5 sacks, respectively. October has been a great month for both teams as neither has yet to drop a game this month. The winner of this game will not head into the playoffs on a high, but will have the chance to host next week’s rematch between the clubs in the opening round of the playoffs. Will the Thunderbirds have that privilege, or will the Bisons force the T-Birds to make the trip to Winnipeg? After another loss at home, the SFU Clan (0-6; 0-3 Conference) travel down to Arcata, California this Saturday to take on the Humboldt State Lumberjacks (6-1; 4-0 Conference). In their 37-26 loss against Western Oregon last week, the Clan put up 370 yards of passing but couldn’t outscore a well-rounded Wolves offence after giving up too many big plays in the second half. Quarterback Ryan Stanford completed 31-of-57 passes for 370 yards and three touchdowns, including a 75-yard catch-and-run to Justin Buren. Buren had his best game of the season, catching seven balls for 146 yards and a score while also returning five kickoffs for 84 yards. Earl Anderson also notched seven catches for 107 yards and a score, while Ante Milanovic-Litre led the ground attack with 18 carries for 97 yards. On defence, Jordan Herdman and Justin Herdman led the team with 5 solo tackles and five and two assisted tackles, respectively. Justin Herdman also recorded a sack on the night, while Quinn Horton also recorded a sack as well as Kyle Wilson who recorded two sacks. This weekend, the Clan faces a nationally-ranked team in the Lumberjacks who defeated Central Washington 42-17 last week. In the win, Robert Webber completed 14 of 22 passes for 195 yards, two touchdowns, and two interceptions, including one to Chase Krivashei, who led the team with eight receptions for 90 yards. On the ground, Ja’Quan Gardner rumbled 28 times for 136 yards and two scores. On defence, Chris Hannible returned an interception for 76 yards while also recording five solo tackles. 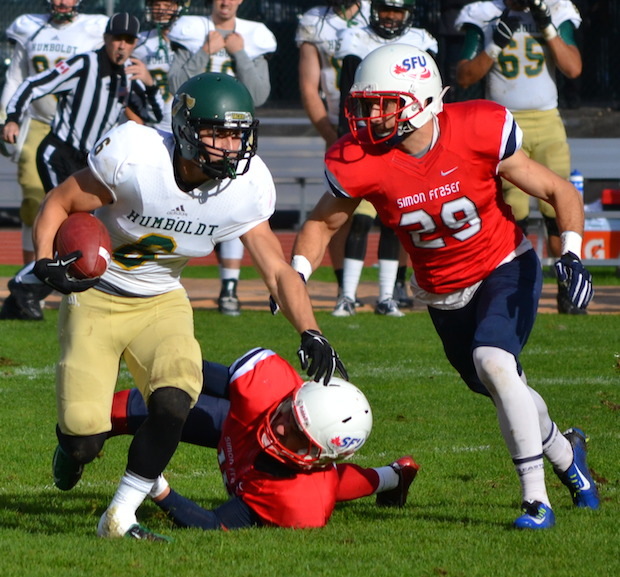 In the win, the Lumberjacks defence totaled twelve tackles for loss for 59 yards and recorded seven sacks, led by Dhillon Huffman’s three solo tackles, two tackles for loss for 14 yards and two sacks, as well as Ahmad Logan’s three solo tackles and two and a half sacks for a loss of 18 yards. The Clan are in tough against the Lumberjacks, but will look to stay competitive as they’ve done all season long despite having yet to record a win. This week, the Notre Dame Jugglers (1-2) visit the New Westminster Hyacks (1-2) at Mercer Stadium for the game of the week in a critical Western Conference matchup. The Jugglers are itching for a win after coming oh-so-close to toppling last year’s Subway Bowl champion, the South Delta Sun Devils, last Saturday. In their 8-7 loss, the Jugglers and Sun Devils were held scoreless until late in the third quarter when Mauro Giamarra intercepted the ball and helped set up Adam Turrin for the team’s only major. The Jugglers also had two touchdowns which were called back due to penalties which ended up costing them as the Sun Devils came back to score the winning points in the fourth quarter. Notre Dame will be sure to clean up their plays heading into an important clash against the Hyacks. The Juggler defence has only allowed 56 points in three games this season and will look to contain the Hyacks, who have scored 84 points in three games compared to the Jugglers’ 49. The Hyacks are also coming off a 28-21 loss to Mt. Douglas but showed true grit despite having to play without five starters in the game, including starting quarterback Jamie Shiho. In the loss, Nick Hauka stepped in and threw two touchdowns, including a 28-yarder to Justin Swartz and a 70-yarder to Michael Thind. Gurvir Ghuman rounded out the scoring and rumbled 14-yards for a score in the loss. In an important Western Conference matchup, which team will come out victorious? Tune in to find out on Friday night! 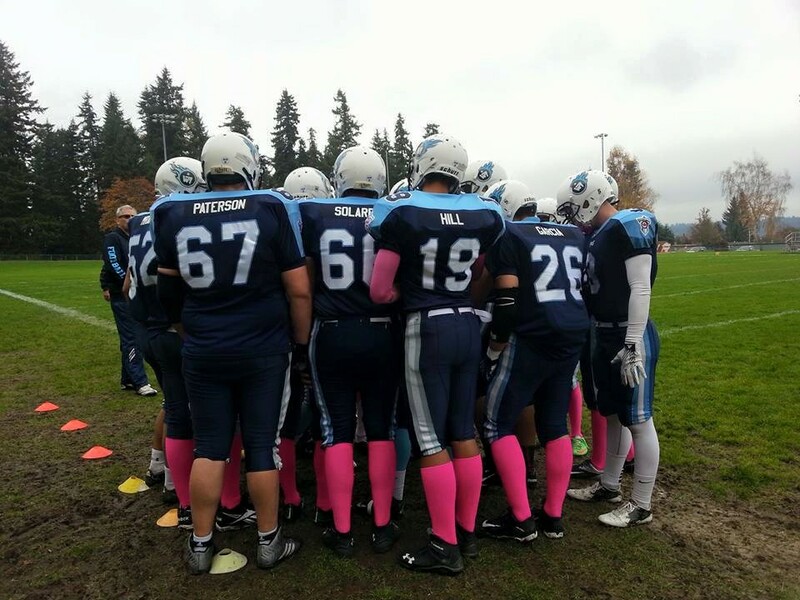 Two teams sitting in the middle of the VMFL Midget Standings clash this Sunday when the White Rock Titans (3-2) play host to the Chilliwack Giants (3-3). The Giants, fresh off a bye, are desperate to turn things around as they enter this week coming off back-to-back losses, most recently two weeks ago when they dropped a slim 21-17 decision to the North Surrey Bears. The Titans, meanwhile, have played just five games this season – tied for the fewest in the division. They went into last week’s clash with the Comox Raiders on a two-game losing streak before snapping that with a 36-0 victory. This is a critical contest for both teams to try and stay within striking distance of the top four in the standings as only those teams advance to the playoffs. 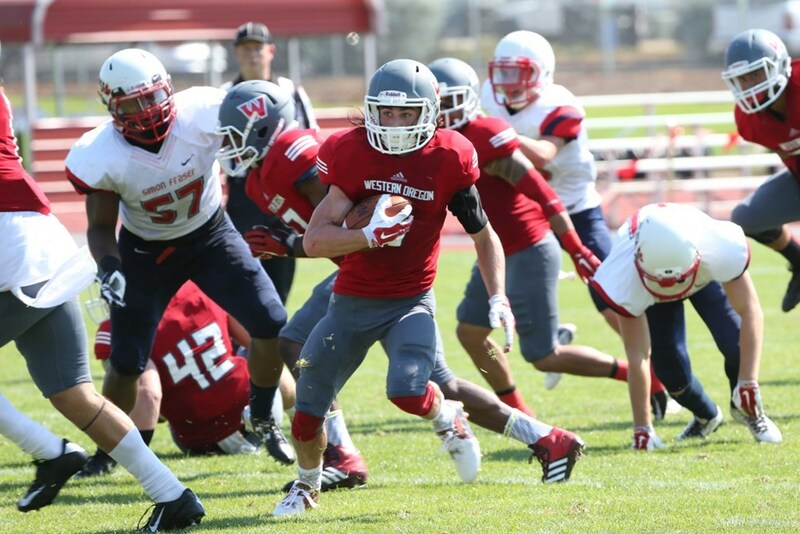 In their penultimate home game of the season, the SFU Clan (0-5) host the Western Oregon Wolves (4-3) this Saturday in the second clash between the two teams this season. The Clan are coming off a disheartening 19-0 loss to the South Dakota Mines Hardrockers and hope they can give their fans something positive to enjoy this weekend for a change. Despite the loss, the SFU offence produced a season-high 183 yards of rushing led by Ante Milanovic-Litre, who rushed for a game high 124 yards on 21 carries. Needless to say, SFU will be looking to build on their run game against the Wolves. At quarterback, starter Ryan Stanford was held to 13-of-28 completed passes for 121 yards and one interception, with Justin Buren leading the receiving corps with five catches for 84 yards. On defence, the Herdman linebacking duo led the way with Jordan recording eight solo tackles and 11 assists, while Justin recorded five solo tackles, six assists and a sack. On the other hand, the Wolves are coming off a 31-25 win over Central Washington and are looking for a second win this season against the Clan. In the win over the Wildcats, quarterback Phillip Fenumiai completed 13-of-19 passes for 176 yards, two touchdowns, and threw three interceptions while also rushing 19 times for 44 yards and a score. On the ground, Malik Braxton led the team with 21 carries for 131 yards and a score, while also leading all players in receiving yards with two receptions for 41 yards. Andy Avgi had the second highest receptions on the team with two receptions for 39 yards and two scores. On defence, Shane Kuenzi led the team with seven solo tackles and four assists, while Max Jackson recorded a sack and three tackles. In their last meeting, the Clan lost to the Wolves by a score of 31-14 and will look to avenge their loss as the teams go head-to-head once again! 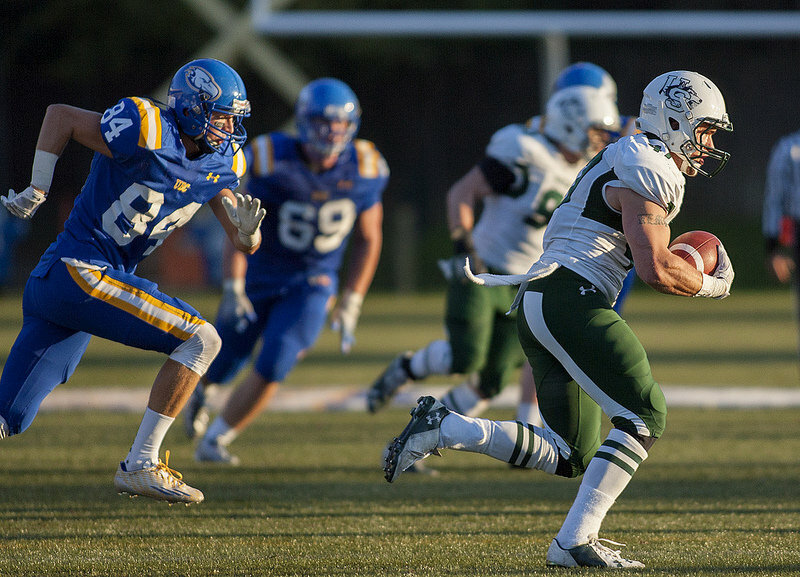 After clinching a playoff berth last week, the UBC Thunderbirds (4-2) will look for another win on the road as they take on the Saskatchewan Huskies (2-4) at Griffiths Stadium. In their 54-10 win over Alberta, Brandon Deschamps was on fire for the Thunderbirds carrying the ball 16 times for a game-high 176 yards and three scores. Through the air, Michael O’Connor finished with 14-of-22 passes completed for 214 yards and a score while utilizing nine targets on the night. Marcus Davis led the receiving corps with five receptions for 63 yards, while Alex Morrison recorded two receptions for 49 yards and a touchdown. On defence, the T-Birds performed well across the board with Mitchell Barnett leading the way with 8.5 total tackles and half a sack, Terrell Davis recording 6.5 tackles and 1.5 sacks, and Stavros Katsantonis recording 5.5 total tackles, two interceptions and a 61-yard fumble recovery touchdown. On the other hand, the Huskies are coming off of a loss to the Calgary Dinos and are looking for a win on home turf. In the loss, Drew Burko completed 13-of-23 passes for 193 yards, a touchdown, and two interceptions, while Julan Lynch and Mitch Hillis led the receiving corps with eight catches for 108 yards and a touchdown and five catches for 74 yards and a touchdown, respectively. On the ground, Tyler Chow led the team with eight carries for 42 yards. On defence, Justin Filteau led the team with eleven total tackles (nine solo) while former Thunderbird Donovan Dale recorded seen tackles (six solo) and a sack. This game will be crucial for the Thunderbirds as they look to clinch the second place position for the playoffs and home turf advantage in the opening round of the post-season. A UBC win coupled with a Manitoba loss this week would ensure that.